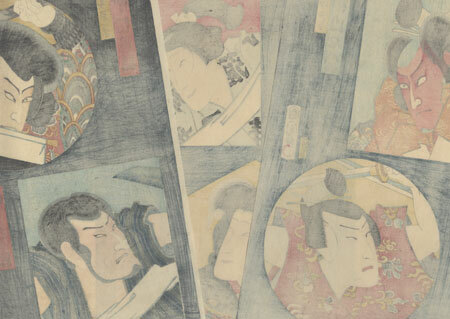 Comments - Terrific kabuki print featuring actors in insets shaped like rectangles, circles, and a hexagon. The colorful figures are set against a softly shaded night sky with handsome wood grain impression. In the left panel from top to bottom, the actors are Ichikawa Kuzo and Nakamura Fukusuke as Nasu Yoichi. 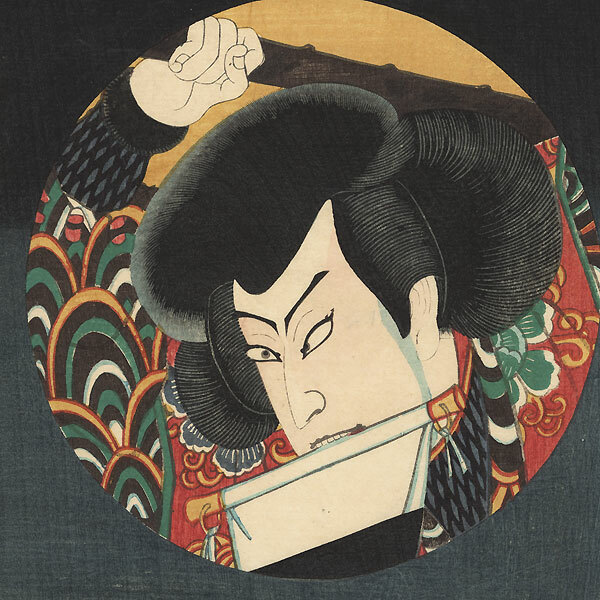 In the center panel from top to bottom, the actors Sawamura Tanosuke as both Soga Goro and the female bandit Omatsu in a snake kimono. In the right panel from top to bottom, the actors are Nakamura Shikan as Motokazu and Seki Sanjuro as a monk at Hakone. A great design with expressive figures in an interesting format. Condition - This print with excellent color and detail as shown. Three separate panels. Slight soiling, a few stains. Please see photos for details. Good overall.